At this morning's Nintendo Direct, President Satoru Iwata revealed a new trailer for Mario Kart 8 that showcased gameplay and stunning graphics. The trailer also shows off some of the new vehicles in the game such as UFO's, ATV buggies, motorcycles, and more as the races now cover ground, air, and sea much like it did in N64 title Diddy Kong Racing. Also announced today was new racer, Princess Rosalina with her star sidekick, Luma, who will also be appearing in Super Smash Bros 4. Mario Kart 8 is confirmed for a spring 2014 release, but an actual specific date has not been pinpointed yet by Nintendo. The previous installment of the game for the Wii, sold 34.26 million copies, making it among the most popular games for the console. 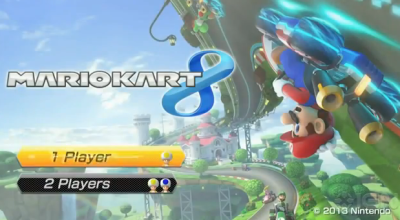 Mario Kart has been a staple of the Nintendo since Super Mario Kart for the Super Nintendo in 1992. The game revolves around characters in the Super Mario universe and their head-to-head racecar battles. Players are able to cycle through a series of weapons and gadgets to enhance their skills on the track. Recently, Nintendo and Namco Bandai teamed up to work on Mario Kart Arcade GP DX for Western arcades this holiday season. The arcade cabinet game was announced back in February and released in Japan in July, which would be the third version of the series behind the console and handheld versions and the third installment of the arcade branch. Mario Kart Arcade has 10 playable courses and will include the characters, Mario, Luigi, Peach, Toad, Yoshi, Bowser, Wario, Waluigi, Bowser Jr., Donkey Kong, Pac-Man, and Don from Taiko no Tatsujin series, reported Polygon.